I was contacted by a family friend last week, Dan Bergeron. Dan has been commissioned by the ROM – the ROM is holding an exhibition over the next few months to showcase street art that depicts the lives of the street homeless, the struggle for affordable housing and to commemorate Toronto’s Tent City. The project, called Housepaint2, first grew out of a Luminato installation on the site of the former Tent City on Toronto’s port lands down by the harbour. 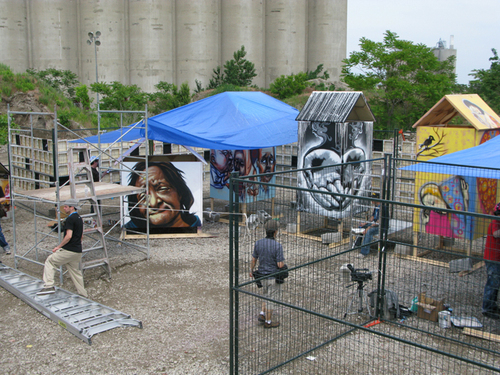 In the summer of 2008, Luminato sponsored the Housepaint installation which consisted of canvas houses on which street artists were invited to portray the homeless and issues connected to the lack of housing. Tent city was a squat on abandoned property just south of the Gardiner overpass, east of Jarvis, which grew slowly in the 90s until it housed over a hundred homeless people in tents, shacks constructed of scrap and the inevitable cardboard shelters. I first visited Tent City in 1999 during a week of homeless outreach and delivered bottled water to the residents there. In 2002, Home Depot, which owned the vacant land, hired private security guards, evicted almost one hundred homeless squatters and bulldozed the tents and shacks. Many of the former residents ended up back out on the streets of Toronto where project417 staff and volunteers still see them today. Dan Bergeron is a rising young Toronto photographer and street artist who runs Fauxreel Studios. He’s perhaps best known for guerilla style billboard “interventions” – [another billboard here of Donald Trump] and poster art mounted throughout Toronto. Dan has been commissioned by the ROM as one of the new artists to contribute to the evolving Housepaint exhibition. As the display was moved indoors in the ROM there was a disconnect with the homeless it is to portray, and Dan hopes to bridge that gap through art that focuses on our homeless friends and raises awareness about their place in our community. 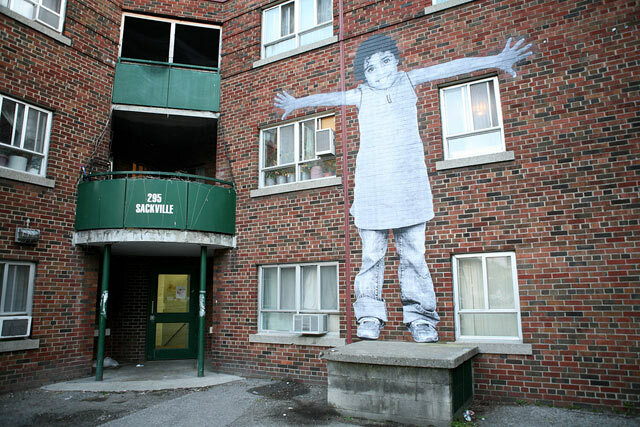 This might be through similar methods to two of his recent projects – the first was also for Luminato and was based in Regent Park last summer – where large portraits of people living in Regent Park were applied to the sides of buildings slated for demolition. Regent Park is Canada’s largest social housing project – most of it is being torn down and re-developed by the city into mixed use dwellings including market value homes and condos, not just social housing – resulting in a massive relocation of hundreds of low income families. According to Dan, in that way the community has a face. The second recent installations last summer and fall were for the AGO – Art Gallery of Ontario’s youth council titled Shiftchange – it similarly was lifesized posters throughout Toronto, and then the hoarding walls around the AGO renovations itself. Over the next months, I’ll be working with Dan through our Project417 outreach programs, like the sandwich runs and community dinners, to connect him to our homeless and under-housed, street involved friends. Hopefully the result will be a series of portraits with the active involvement of the subjects to depict their real-life struggles with homelessness and inadequate housing solutions and a connection to their hopes and future aspirations of careers and life. Dan’s hope and mine is that there is ongoing follow-up with these homeless friends to contribute to them in a real way. We look forward to the installation at the ROM when it is ready – based on Dan’s past works it is bound to raise community awareness about the homeless and make a real difference.